Hauling trash cans at our place is a bit of a pain. The cans are large and heavy, and they need to roll down a long, steep driveway. Most smaller people haul them they way the girls are doing in this picture -- backwards. 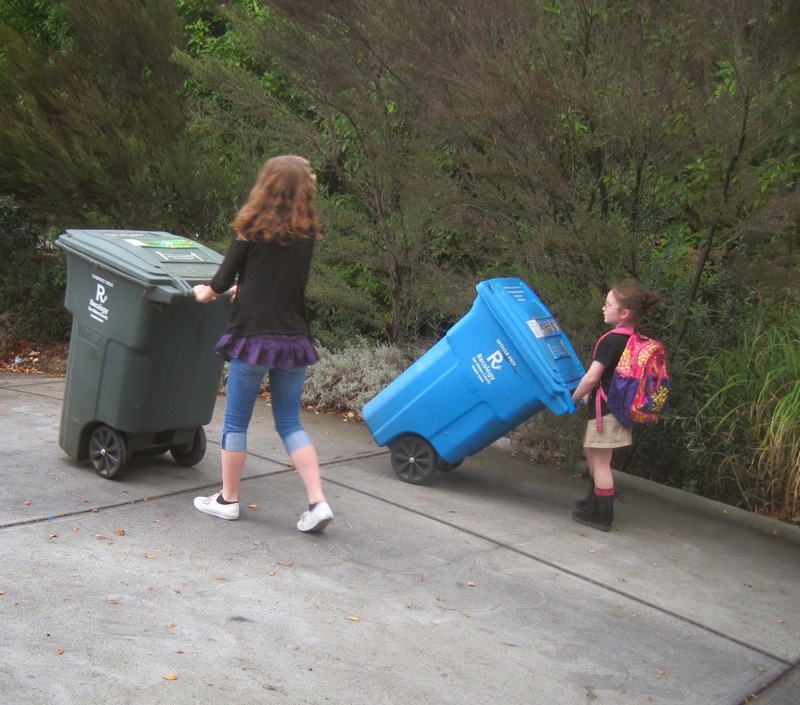 Adults, however, turn around, push their can down to the position of Mali's can, and hold and pull it behind them as they walk forward down the driveway. All of this is fascinating to you, I'm sure. But it's important background information. Because yesterday Leo helped me haul the cans down the driveway. And instead of wrestling with his can, trying to push it down the driveway, or defaulting to the girls' backward-pulling walk, he stopped for a moment, carefully observed the way I had positioned my own can, and then imitated my pulling technique exactly. I did not give him any instructions or prompts -- he did this all on his own. You could almost see the intelligence crackling and sparking around his head. He was thinking, and thinking hard, and problem solving, and doing it independently. It was a small moment, but it struck me deeply. It's the kind of demonstration of ability that tends to get overlooked, precisely because it was not communication-based. And it makes me wonder exactly how much of an iceberg Leo is -- what we can see of his ability, as opposed to what we can't see. And how frustrating that must be to him. It's one of the reasons he's in the middle of a full AAC evaluation -- to ensure that he has the opportunity to demonstrate what he knows, and what he can do, and tell us about it to the best of his abilities. So he can tell us what he wants, how he feels -- so he can communicate with us, and everyone else, on his terms. To the fullest extent of his terms. I'm not banking on an Ido-like communication breakthrough -- though that would be wonderful (for Leo most of all) -- because Leo is Leo, and should not be held to anyone else's standards. But we owe it to him to find out exactly what those standards are. I hope we don't let him down. This video is how I want to remember 2013. All of our family, together with extended family, delighting in life and each other's company. Our family had so many amazing times in 2013, and had so much to be grateful for -- not the least of which was the people in our lives, whether connected by blood or choice. Tardily wishing you a happy 2014. Obviously, we are iPad fans. And I enjoy talking about how helpful iPads have been for Leo, and how they can help Autistic people of different ages & abilities. However. 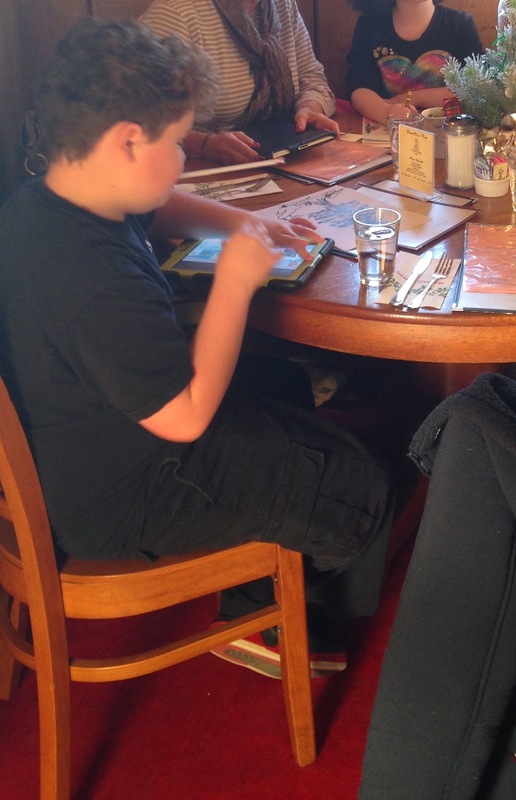 Just as many standard iPad features (e.g., large touch screens) are surprisingly useful for kids with disabilities -- and that's not even getting into Apple's extensive built in accessibility options -- others features could still use a bit of tweaking. So here's one option I'd like to see: turning off deleting videos in iTunes. The compulsiveness that accompanies Leo’s autism means he cannot stop himself from systematically deleting every last one of his favorite iTunes videos. He does this because deleting items on the iPad is fun! But then, crap, all the videos are gone. This is ... bad. We can restore all purchased videos, of course, but it takes time, and sometimes it would make a world of difference to him if his favorite videos were always there when he needs comfort and familiarity and control (iTunes allow him to skip straight to and loop his favorite scenes) to get through a difficult patch. I do not think he would be upset about not being able to delete videos, he adjusted quite quickly to not being able to delete apps once that function was enabled. But if the option to delete is there, oh yes, he's going to take it. So I do wish Apple would create an option to turn off deleting iTunes items, just as we can turn off deleting apps, because I doubt Leo is the only helplessly self-thwarting video-loving autistic iPad user in town. Which iPad features do you wish were tweaked or changed for an even better user experience?